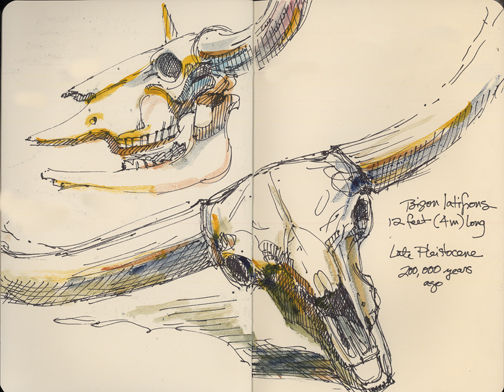 Had a lovely day with a couple of art friends, Becky and Mitsuno, sketching for fun at the Sam Noble Oklahoma Museum of Natural History. We went to a quiet spot in the Ancient Life Gallery that is inhabited by creatures of the Pleistocene, Miocene, and Eocene. Some beautiful bony beasts in there. I decided to switch from pencil to Sharpie pen today, working in a 5″x8″Moleskine sketchbook. Sometimes it’s just satisfying to play in black and white. But then Becky loaned me her waterbrush and teeny tiny watercolor box, a 2″ metal thing meant for kids. She’d dug out the cheap cake watercolor and replaced it with quality tube paint, squeezed into the little spaces and allowed to dry. I’m now determined to follow her example. The perfect pocket paint kit. Nothing like a big, hungry, fast running bird of prey to keep things interesting for the bird-watchers of the Eocene Era. There is something restorative, refreshing and motivating about drawing. It’s a beautiful thing, the way it re-orders the universe and aligns the brain cells with the fingers and eyes and the heart, if I may be a little florid about it. A few hours of sketching is called for every so often. Dr. Motmot recommends it highly. We were struck by how hand-like the forefeet of the Mammoth were. Yes, Doc. I think drawing can be taught and painting can’t. Fantastic sketches; what a great day you had! I really like the bird drawing. Wouldn’t want to draw a live one from life. How lovely to draw these skeletons. They’re so graphic and solid looking. You inspire me to go to the museum here and see what I can find to sketch. How cool is it that mostly what you put up on your blog is ART?? How many of us can say that? It’s such fun to see what you’re up to. Great drawings, I miss the SNOMNH…. 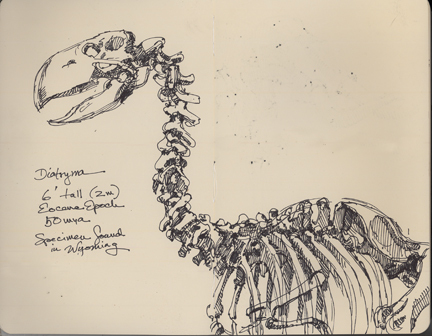 The large carnivorous bird was always my favorite skeleton! I still have to pick up my jaw from the floor. Your drawings and paintings are truly amazing and a sight to behold! I am so glad to have found your blog. I will be back! 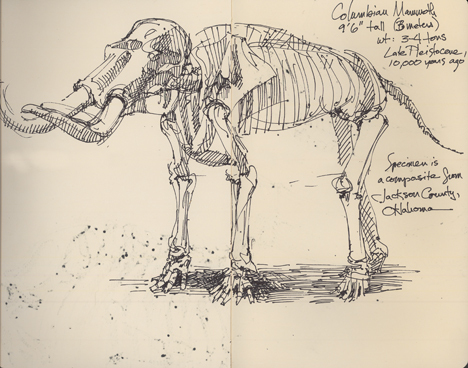 Those drawings are fantastic – like something from a turn-of-the-century naturalist/explorer’s collection. Your talent and imagination are boundless. You have such an eye for detail. I am in awe!